We had the pleasure of interviewing Reel Brands Co-founder, Ian Bates. Reel Brands are experts in sustainable packaging, and work with companies to help reduce their impact on the environment. With plastic being such a hot topic, we got Ian’s views on new innovations, 2019 predictions and how brands can reduce the amount of plastic used in their packaging. It makes for a very interesting read. What can brands do to maintain shelf life and reduce plastic? I think we should start this with a discussion of the shelf-life dilemma. Over the years, the demand on shelf life has rocketed, and the technology has advanced along the way to keep up. Advances in sealing technology, gas flushing, metal-laminating and more, we have adapted to just saying ‘yes’ to the demands of the buyer. The reason plastic has been able to help a pack sustain better shelf life is mainly down to the ability for sealing to itself. However, bio-polymer technology is catching up. In the same way that we pioneered sealing technology using plastic as the conduit, we are now speeding bio-polymers through the process. Successful trials have led to advancements such as the home compostable crisp pack. Which is essentially a cellulose layer, laminated to a metalised cellulose layer which is then sealed as per normal. This does impact a little on shelf life, more 3-6 months than 6-9, but we aren’t miles out. It’s also worth noting that albeit shelf life is the ‘holy grail’ at the moment, one client of ours reported that one of their major retailers suggested that their products were going through the supply chain to end user in less than four weeks. There has to be a Ying to any Yang, and in the situation of removing plastic from packaging, the yang is currently that the shelf life is slightly affected. That’s not saying however that it has to be affected by much. A brand looking to reduce plastics and maintain shelf life should look at getting the best seal they can from their pack, this comes down to the materials used. The easy answer would be to move into packaging that is already proven in keeping a product preserved for a long period of time, such as aluminium canning, glass jars etc… however, these aren’t often practical. There are some pretty big developments happening in the coming weeks, and we’ll have a much clearer idea then, so watch this space. What innovations are available to help reduce plastic? The simple fact is that at the moment, there isn’t a magic solution that solves all our problems, albeit there are plenty of ways to lessen our impact on the environment tenfold. Whatever packaging we use, we are taking something from the planet in some way. What we do need to consider is whatever we take, must be able to be broken back down by Earths natural flora and fauna – which isn’t the case with plastic. Sadly, every piece of plastic we have made since it’s invention still exist today. Glass and metal are expensive and have a high carbon footprint, leaving us with paperboard – which is sustainably sourced (with FSC certification) is likely the most easily sustainable packaging material, however to make it useful in many applications, it needs a coating to be able to seal and keep airtight. In terms of innovation, we have made some great breakthroughs with bio-polymers such as PBS (Polybutenol Suctanate, sugar cane derivatives), Cellulose (from woodpulp) and of course, PLA (polylactic acid, from corn). Albeit, it’s worth quickly noting that a lot of PLA comes from the USA which usually has been made from GM crops, so if this element is a bother, source PLA from Europe, where it will be GM free. We have successfully proven the possibilities to make coffee cups totally recyclable and compostable (industrial currently, but soon to be home compostable) by using a bio-bps coating. We have also started working with a paperboard that is waterproof and plastic-free which we are using to make all manner of products and packaging out of too. We are weeks, not months away from creating a fully sustainable and a sensibly priced fruit punnet, meat tray, a ready meal tray plus many more applications. There are some ‘off the shelf’ innovations, such as compostable and recyclable pouches, dual ovenable trays, compostable crisp packs etc… however the key to success using these is to ensure you integrate them into your supply chain properly and make the necessary adjustments to machinery and other areas to adopt these. In one case, a client of ours swapped over their reels of laminated film to a bio version and hadn’t realised that you needed to fin-seal rather than lap-seal, which incidentally they didn’t have the correct tool for. This caused chaos and could have easily been avoided by going through the process with someone who has had experience in this field already. As a brand, how can you combat the plastic backlash? Firstly, we all have to be honest with ourselves before we try to preach to others. I am a plastic addict. For years, I have been buying and using plastic in my everyday life. Albeit I’ve worked in sustainable packaging for over 30 years, I still have to admit that I buy many products shrouded in plastic and would find it very hard to cut all plastic out. Brands need to also admit that they are embroiled in plastic and tied in deep. The work of 100 years of innovation in plastic can’t be undone by clicking a finger. We owe a lot to plastic in some ways… yet, we have an urgent need to reduce our use for the better of our health, our future generations, our planet. In the same way we used to use lead to make pipes and drinking receptacles in the past, until we realised it was killing us and moved on, the time is nigh for us to do the same again. 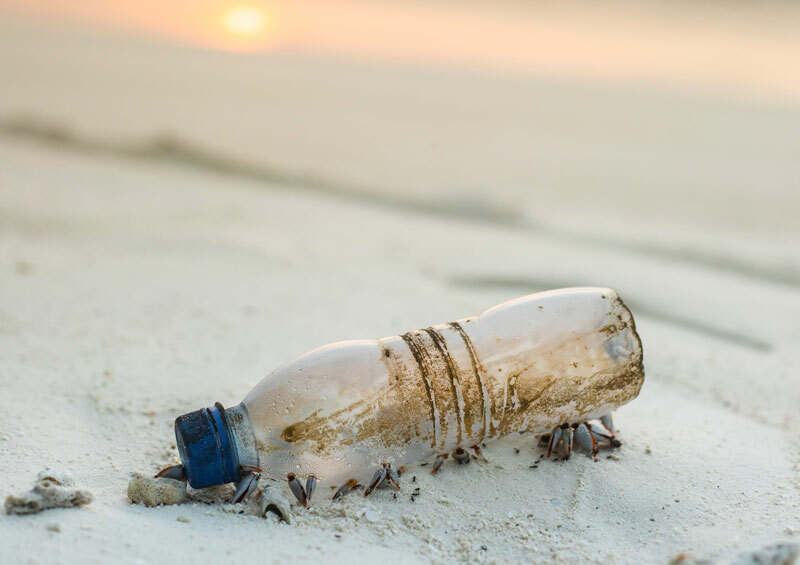 A brands PR strategy should set out to communicate that it is looking to reduce plastic usage within the business and set out a realistic timeline to do such. Start by making some easy wins and using them to publicise your efforts. People understand that Rome wasn’t built in a day, but we need to make a step forward to get going. Is going ‘plastic free’ achievable for all businesses? Can the artisan producers cope with the premiums? Yes, I believe it is. I have worked with clients such as Unilever who gobble through more plastic than you can imagine, who have also pledged to become plastic-free, albeit knowing that there will be many, many dilemmas along the way. Right through to small artisan brands such as ‘The Curiosities Co’ who launched their premium bacon into the worlds first home compostable and recyclable chilled bacon pack. If anything, it is actually easier for artisan brands to lead the way with innovation. Once you have a large supply chain, factory and buy in huge volume, it becomes much harder to make changes. In terms of the premium pricing, this isn’t something to really worry about either if careful. As a rule of thumb, I tell clients to expect that the packaging price will double by going plastic-free. If you have a higher margin due to volume, you should be able to stomach this a little easier than a mass volume business where we look at decimals of a penny. One other aspect many forget is the other aspects you can change to lower overall cost. We try to innovate in other ways to design a better supply chain ready pack that then costs less in other areas to absorb the cost increase of the packaging material. For example, we own a bespoke shoelaces company and we went plastic-free last year and actually save money per pack because of a new design and logistics charge. What are your plastic free predictions for 2019? Up until now, the plastic debate has centred around the health of our planet, especially the oceans (the ‘Blue Planet effect’). However, studies are coming out shortly that will change the argument from planetary to how the chemicals used in plastic packaging harm our health and the health of our children. I believe this will see consumers demand faster change. Governments around the world have been fairly conservative with their policy, however, this is also starting to change too. Major retailers are facing PRN bills that can’t be easily swallowed with their lessening profits, and they get marked badly for their waste output that isn’t widely recycled. I believe our wonderful small artisan businesses leading the way with innovation will see more large brands joining the movement and using these as case studies to help them toward going plastic-free and with that, the economies of scale will tip in bio-polymers favour and help pay for more innovation, cheaper materials and better understanding. We are only residents on this planet – let’s leave it how we found it.